The Reading Hour, this Norman Rockwell painting, appeared on the cover of The Literary Digest published March 25, 1922. 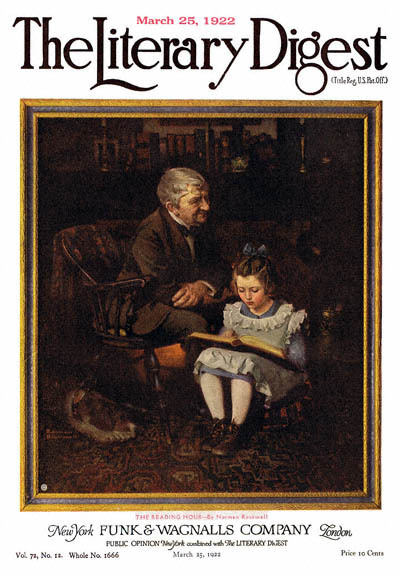 The alternate title for this work is Little Girl Reading to Grandfather. This illustration was Rockwell's thirty-fifth picture featured on the cover of The Literary Digest. The Digest featured Rockwell artwork on the cover nine times total in 1922 alone. on page 61 of Norman Rockwell, A Definitive Catalogue by Laurie Norton Moffatt. The original oil on canvas painting, 31.5 x 27.5 inches or 80 x 70 cm, is part of a private collection. With this painting, Norman Rockwell visually takes us back to time spent with grandparents or grandchildren. The Reading Hour was only one of 47 Norman Rockwell Literary Digest covers; here is the list of more Norman Rockwell Literary Digest scans. Sitting by the fire, Grandfather listens quietly to his granddaughter intently reading out loud. He has a kindly smile on his face. Is he smiling at the story or at the reading of it? His dog lies calmly beside the chair. The dog is enjoying the fire and the company. It is possible that the dog is also enjoying the story. Grandfather has lots of books on his fireplace mantle. They're visible in the background. His pride in his granddaughter's reading is obvious. This is clearly a family of readers. During this era, children had to entertain themselves. Reading was just one method, but it was no doubt the most rewarding intellectually. Both Granddaughter and Grandfather were enriched by this time together.